In this interview with Dr. Russell Jaffe, we will explore the importance of the acid/alkaline balance. Dr. Jaffe explains what this balance is and why it is critical for human health. We will explore the challenges of a body that is out of balance and more importantly how does one correct an imbalance. You will learn how you can maintain a better balance over your lifetime. This is one of the important biomarkers that you can manage yourself at home. Once you understand how to do this through diet and supplementation you will be able maintain the balance in the healthy range. Maintaining an internal acid alkaline (pH) balance in the optimal range supports your bones and your body. Bones are the body’s “mineral storehouse”. Not only do bones provide strength, but they also house our mineral reserves and allow us to maintain optimum pH levels. Increasing the intake of alkalinizing minerals through an alkalinizing diet is the most fundamental and effective way to keep your pH within that all important health restoration zone (6.5 – 7.5). In addition, certain alkalinizing supplements like PERQUE magnesium and choline citrate can help you achieve and maintain the healthful acid alkaline balance. A recent study shows how increasing alkalinity helps improve bone density. Read more. Dr. Jaffe has produced a free e-book entitled Joy in Living: The Alkaline Way. This Health Studies Collegium Resource Guide is 124 pages that will provide a roadmap that you can follow to understand and implement more alkaline living. You can download the file here. The Alkaline Way is based on the most effective approaches to improve quality of life and sustain health and happiness. Since we are a product of what we eat, drink, think, and do, it is critical that we remember that optimal health and happiness come down to choice much more than to chance. That’s why this guide is designed to inform you so you can make healthier choices when it comes to how you nourish your body, mind, and spirit. Here is everything you need to support your body’s own natural immune defense and repair, and digestive, detoxification, and neurohormone functions. The goal is to prevent illness and disease by more safely and completely meeting your body’s needs. Health is a matter of balance. The cells of our bodies are always seeking a healthy balance to keep us alkaline. Even a small shift toward more acid is linked to a great increase in disease and loss of cell resilience. When our bodies are in a more acidic state, they are weaker and more vulnerable to disease; our defenses and ability to repair from usual wear and tear are down. When our bodies are in a healthier, more alkaline state, they are more resilient and can resist and recover from illness more effectively. Foods that we choose have a great impact on our health, as summed up by their effect on our acid and alkaline balance. When we consume a diet high in fat, processed foods, sugar, and protein—also known as the common American diet—our bodies become more acidic, and less resilient. This state is known as metabolic acidosis. On the other hand, when we enjoy a diet rich in greens, plants, fruits, vegetables, minerals, and antioxidants, our cells become more alkaline, and more resistant to everyday stress. Just a slight shift in either direction can have a dramatic impact on our health— for better or worse. 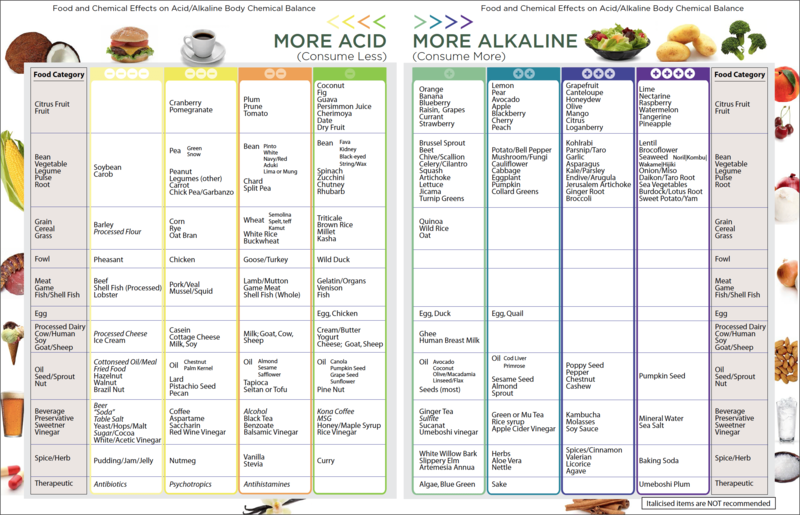 Dr. Jaffe has provide a wonderful acid/alkaline food chart that you can use to understand which foods are acid producing and which foods are alkaline. Begin eating more alkaline foods and reduce acid forming foods. Eating healthy is difficult to achieve for many Americans. With the food choices given to us, it’s paramount to stay focused on what’s important – your health! There are seven principles of eating “The Alkaline Way” to help you through your journey. Incorporate these principles to create and enjoy a delicious and healthy Alkaline Diet. All of this covered in greater detail by Dr. Jaffe. You can read more here and/or by downloading The Alkaline Way. The pH level of urine after 6 hours of rest reflects pH throughout the body. Levels below 6.5 indicate metabolic acidosis. Low pH also suggests mineral deficits, because minerals are pulled from bone and body fluid during metabolic acidosis to buffer and reduce acids and maintain pH within a health range. Acid-alkaline balance is important. Tiny changes in pH have profound implications for cell metabolism. Life exists poised exquisitely just above the neutral point of 7.0. Levels of pH above 7.5 can indicate catabolic illness in which amino acids are used as energy sources. Any unusual variation in urinary pH is usually reflected in the first morning urine. This calls for changes in diet and/or nutritional supplements to restore acid-alkaline balance. Simply checking the pH level each day provides ongoing monitoring to see whether pH has been corrected. (Click here for 1st AM Urine pH test protocol) This is an important aspect of biochemistry – so if there is an abnormality, that has to be monitored regularly. Healthy values are urine pH in the 6.5-7.5 range. For more than 20 years, Health Studies Collegium has focused on researching the mechanisms of health, and conducting community-based, randomized controlled trials to test the clinical and cost-effectiveness of health promotion models. HSC is home to a group of leading health professionals who conduct innovative and timely research within a collaborative innovation network. Collegium members additionally participate in commentary, programs and studies that advance proactive prevention in healthcare practice and policy. Dr. Russell M. Jaffe received his BS, MD and Ph.D from the Boston University School of Medicine in 1972. He completed residency training in clinical chemistry at the National Institutes of Health (1973 – 1976), remaining on the permanent senior staff until 1979. He is board certified in Clinical Pathology and in Chemical Pathology. On leaving NIH Dr. Jaffe began a journey that sought to support the emerging field of Integrative and Regenerative Medicine. Dr. Jaffe is CEO and Chairman of PERQUE Integrative Health (PIH). His dedication to the application of primary prevention and his commitment to providing superior nutraceuticals and autoimmune testing with clinical evidence of superior efficacy has made him a sought after speaker and leader in his chosen field. Currently we require that you request subscription via email. Send us your email address and name and we will confirm your subscription. We are doing this because of spam email subscriptions. This will assure that spammers can’t subscribe another’s email address. Once subscribed you will receive an email when each new podcast is posted. You can always unsubscribe in any email you receive. Thank you for being a listener. Please recommend us to your friends and social media. Optional: Include your first and last name. The app is simple and easy to use. CLICK HERE for easy instructions. Subscribe via iTunes or RSS. Like us on Facebook. The information discussed on this site is not intended as medical advice. For all medical problems see your physician. Content Copyright 2011-2018, Health Quest Podcast except as held by any other copyright holder. All logos, trademarks and copyrights are the property of the respective holders. Opinions expressed by the host or the guest are not necessarily those of the sponsors, trademark holders, or any other person or company referenced throughout the website.